With 17 tribes represented in the newest Permanent Collection exhibition Honoring a Legacy — it's easy to see how expansive Alice Bemis Taylor's collection of Southwestern art is. One of the tribes featured is the Papago, also known as the Tohono O'odham, which translates to "Desert People." Many members of the Tohono O'odham reject "Papago" because it was the name used by the conquistadores. Most now live in southern Arizona, but there is a contingency residing in northern Sonora, Mexico. We've re-printed a Tohono O'odham creation story (source) to offer greater insight into this Native American tribe. Storytelling in Native American culture relies heavily on oral tradition, so try to tell this story out loud, and see what pops out to you when you share it! Long ago, they say, when the earth was not yet finished, darkness lay upon the water and they rubbed each other. The sound they made was like the sound at the edge of a pond. Earth Medicine Man finished the earth. Come near and see it and do something to it. In this way, First Born finished the earth. Then he made all animal life and plant life. There was neither sun nor moon then, and it was always dark. The living things didn't like the darkness, so they got together and told First Born to make something so that the earth would have light. Then the people would be able to see each other and live contentedly with each other. So First Born said, "All right. You name what will come up in the sky to give you light." They discussed it thoroughly and finally agreed that it would be named "sun". Next, First Born made the moon and stars, and the paths that they always follow. He said, "There will be plenty of prickly pears and the people will always be happy." That's the way First Born prepared the earth for us. Then he went away. Then the sky came down and met the earth, and the first one to come forth was I'itoi, our Elder Brother. The sky met the earth again, and Coyote came forth. The sky met the earth again, and Buzzard came forth. Elder Brother, Earth Magician, and Coyote began their work of creation, each creating things different from the other. 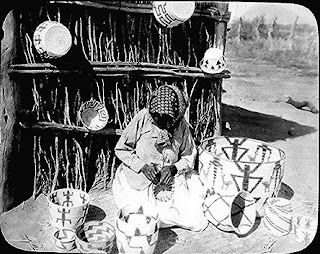 Elder Brother created people out of clay and gave then the "crimson evening," which is regarded by the Tohono O'odham as one of the most beautiful sights in the region. The sunset light is reflected on the mountains with a peculiar radiance. Elder Brother told the Tohono O'odham to remain where they were in that land which is the center of all things. And there the desert people have always lived. They are living there this very day. And from his home among the towering cliffs and crags of Baboquivari, the lonely, cloud-veiled peak, their Elder Brother, I'itoi, spirit of goodness, who must dwell in the center of all things, watches over them. 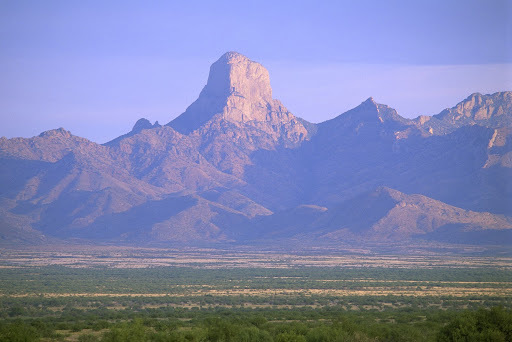 Baboquivari Peak in Pima County, Ariz (image source).